These days it's hard to do anything in England without paying for it, but when it comes to parking things are really getting ridiculous! In every town, on every street corner, you can be sure to see a gang of frenzied parking inspectors, on a mission to rinse you of all your cash for the slightest parking misdemeanour. Things are so bad nowadays that even paying parkers who have left their car slightly over a white line, or touching the curb, are being given tickets, which can cost drivers hundreds of pounds! Lambeth in London, is one of the worst offending councils for ticketing parked cars. Not only does this council employ more parking inspectors than most others in the UK, but they also charge the highest fees for 'illegal' parkers. Park in Brixton without a ticket and expect to be spotted within 15 minutes. When you get back to your vehicle, don't be surprised to find one £60 fine for not having a ticket and one £70 charge to release the bright yellow clamp attached to your front tyre! Private parking enforcement companies can be even worse that this! Private car parks (such as those found behind shops and offices) are often regulated by private car park companies who are almost always absolute tyrants, who use pretty blatant bullying and illegal means to pursue massive parking fines. Luckily for us, despite this type of firm having been known to charge hundreds of pounds to 'customers' unless they can prove that you parked when they say you did, you can quite easily escape this type of fine. These modern day extortionists really know what they're doing, and it's time for us drivers to fight back! 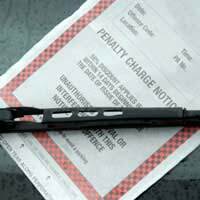 Unlike private parking enforcement companies, local councils are judge, jury and executioner, when it comes to parking fines. The same people who control the parking inspectors, control the local council courts. Council parking wardens have been highly trained to know exactly what is a ticketable offence, and what isn't. However, there have been many occasions where unscrupulous ticket inspectors have given tickets to unwary drivers without any good reason! If you receive a ticket the first thing you need to do is to closely inspect the details. If any minor detail (such as the date, the car registration, the car colour, the type of misdemeanour) is incorrect, then the ticket is invalid, and all you need to do is to point this out in a letter of complaint to the appropriate address, detailed on the ticket. If you cannot find any error on the ticket, and you know you have parked illegally, it is still worth campaigning. Although some councils are truly terrible, some can be lenient, especially if you have a valid reason for parking without paying, such as being taken ill, or being forced to stop after a minor accident, or something similar. Parking tickets handed out by private parking companies are much easier to blag your way out of. This is usually because this type of parking ticket is unjustified in the first place! Private parking companies who monitor car parks fine, and ask questions later. If you receive a ticket (for example, you overstayed your allowed time on a shop car park) the first thing to do is to write a letter to the company complaining about the fine. Explain that you are not prepared to pay the fine and leave it at that. Bear in mind that unlike councils, private parking companies must be able to prove, beyond doubt, in court if necessary, that YOU specifically, were driving your car. Therefore, unless they have video evidence of you driving the car at the time in question they will not be able to pursue your fine any further. Furthermore, private car parking companies almost always charge excessive fines (over £100) when the law clearly states that a car park fine must be relevant to the costs incurred to the car park owner (more like £20 - £40). If your case ever went to court, a judge would almost certainly rule a fine of this sort illegal. Private car park companies know full well that they would lose any case that went to court, so feel free to warn them that you are prepared to take them to the small claims court if they do not stop contacting you. This should get them off your back! Private car park companies are bullies. More than likely they will send you powerful letters from 'bailiffs' demanding your money if you do not pay. Do not be scared in to paying! Be aware that no company is allowed to send bailiffs to any person until they have proved themselves right in court. If they ever did this before going to court, you could sue. Parking fines are becoming an increasing problem for motorists in the UK, but in most cases they are poorly issued with the intent of profit making, either for councils, or private companies. Why pay someone who is trying to con you out of your cash? Blag your way out of your fines, and save yourself some money - as any driver knows, you'll need it if petrol prices keep going up! the best way to get off a ticket is when you have been issued a parking ticket immeadiately go to the nearest petrol station and get £5 worth of fuel and get a receipt then send a letter to the issuer of the fine explaining that your car had run out of fuel and apologise to them , make sure you include the receipt to add confirmation of your story. So far I have got off twice in the same place!! !